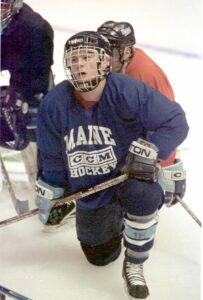 UMaine's Steve Kariya listens to coaching instructions during practice in preparation for NCAA Division I semifinal game against Boston College in Anaheim, Calif., on April 1, 1999. Kariya, who is now a pro scout for the New York Islanders, led the 1999 team with 27 goals and 38 assists. STAFF PHOTO BY HERB SWANSON,MARCH 31,1999-ANAHEIM, CA-University of Maine wing Steve Kariya listens to coaching instructions during practice Wednesday at the Arrowhead Pond Arena in preparation for Thursday NCAA Division 1 Hockey Semifinal game against Boston College.